It has been several weeks since I have posted a bird quiz due to having limited internet while I was in Hawaii. Since it is the end of the month, we have decided to turn this quiz series into a series of just two quizzes. Almost everyone got the first quiz right so this quiz is a little harder! The shape of the bird in our id quiz is more distinctive than most. The duck-like shaped body, with a long neck, small head, and needle-like bill should land you safely in the phalaropes. From here it gets a bit more difficult but it should still be quickly identifiable. 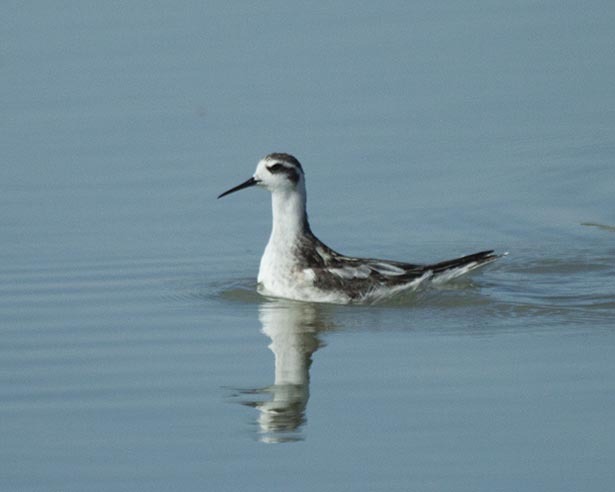 The black face mask rules out Wilson’s Phalarope and the needle-like bill with a dark base rules out Red Phalarope. So, we are left with our only other phalarope, the Red-necked Phalarope. The final quiz in our February quiz series is posted here: http://nuttybirder.com/BirdQuiz/birdquiz.html#.USwpTqUvwVA.